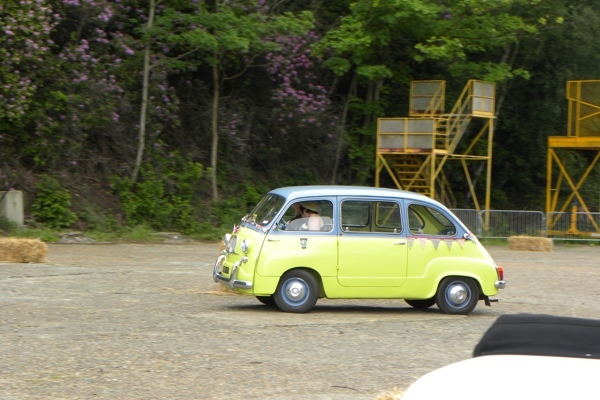 Thanks to fellow GRRC member Phil Starling for sending us this wonderful photo of Mario on the test hill at Brooklands yesterday. A lovely sunny day for day two, very welcome after the past few weeks, we’ve been very lucky this weekend other than the wind yesterday. Today was a slightly different format, our first task of the day was a few parade laps around the Mercedes Benz world test track. It’s a very tight track so Mario didn’t seem to be too slow and managed to keep up with the rest of the field. 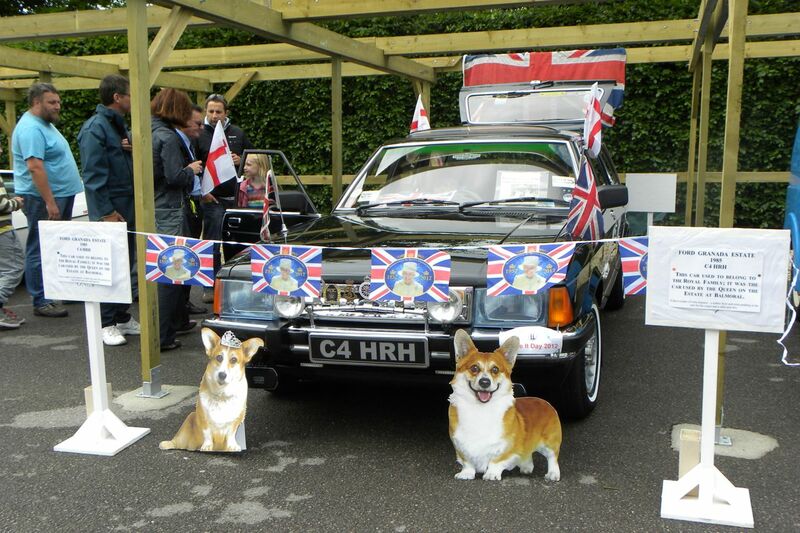 Next up was the concours judging, unfortunately we prefer having fun to polishing and can’t be bothered with the this is/isn’t right, the judges a Frenchman and a Swiss didn’t appear too interested in Mario and his bunting and corgi wasn’t understood at all! If it had been up to the public we would have won hands down, as usual Mario’s fan club was much in attendance. The final part of the day w four more tests, feeling more confident we found ourselves discussing the fastest route, worryingly competitive. 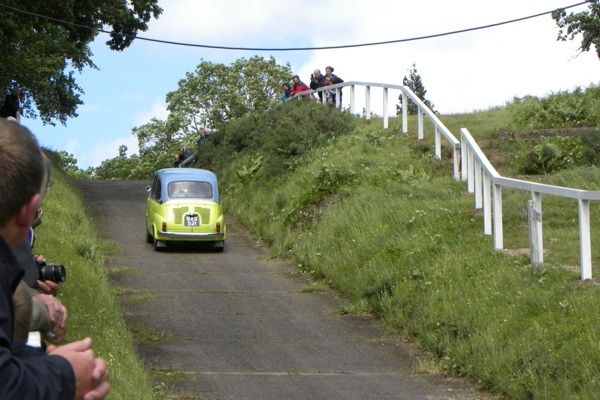 A third run up the hill was successfully completed folded by two simple quick tests performed on the banking and finally parking in a series of five ‘garages’ and a tight circle. We felt we were performing well and certainly didn’t make idiots of ourselves. 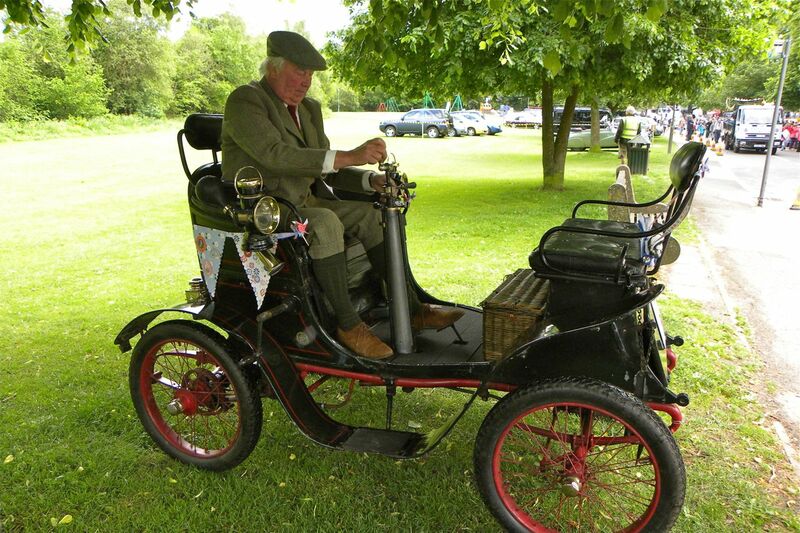 It was a shame that the link between our class was lady drivers as the cars were the most varied class which unfortunately meant we were in competition with much more powerful vehicles. The winning e-type had an engine eight times larger than Mario so although we tried our best and didn’t make any mistakes we couldn’t get anywhere near their time. Our final placing was only 9 out of 12 but not really representative of our performance, but never mind, taking part and having a great time was our intention and we certainly achieved that. 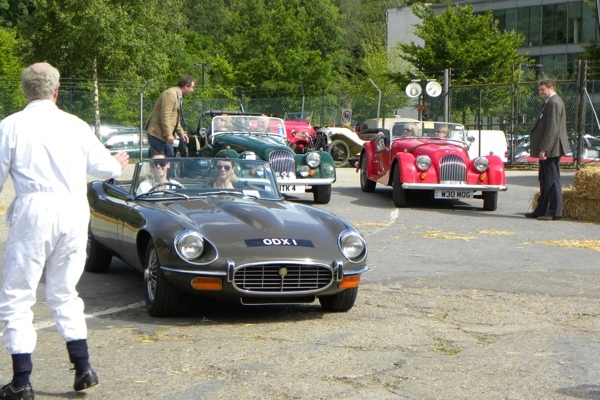 The last two pics are others in our class and the top three – the e-type and two Morgans, others including a Bentley, Bristol and MGA. We should receive the full results in due course so will update with some times later. 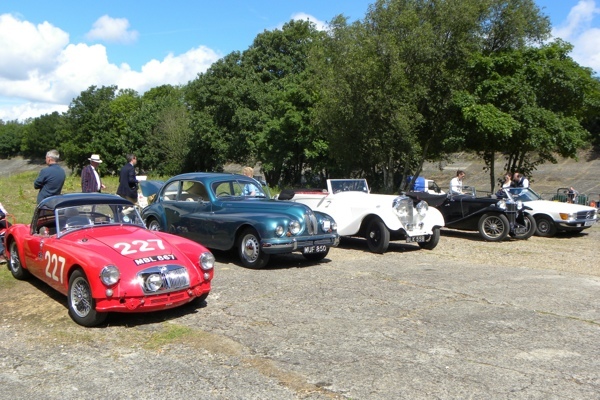 Today was the first day of the Brooklands Double Twelve competition. 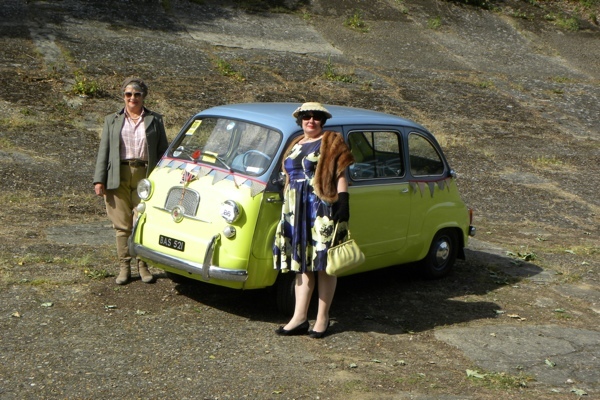 Mario with driver Jane and co-driver Jan were in the Coup des Dames class with an assortment of entries including an e-type, a Bentley and a Bristol. 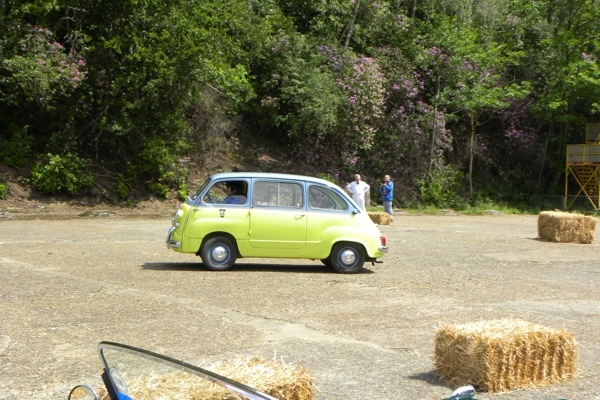 We had never done a driving test before and with the first test of the day being the test hill we were rather nervous. We needn’t have worried and Mario sailed up in first gear to the crowds delight, after that we were in the swing of it all and driving round bales, into boxes and stopping across lines became a great fun experience. We don’t know our times yet but only made one mistake in the two runnings of the four tests so feel we can hold our heads high. Really enjoyed the day and there was gorgeous cake too! 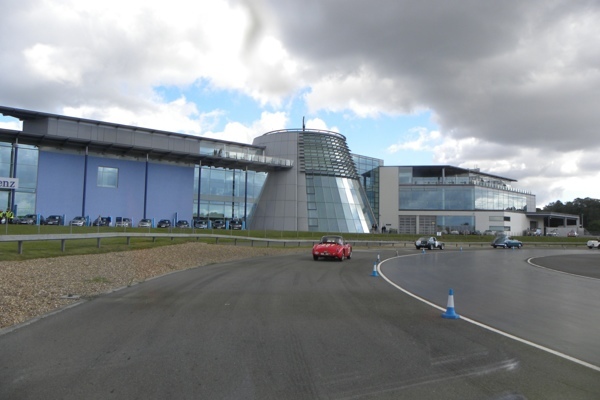 Looking forward to going back tomorrow for another round of tests, some parade laps around Mercedes Benz World track and a concours competition, hoping it might be a little less windy tomorrow so that hats and furs stay in position. Will be back tomorrow to let you know how we got on. At the bottom of the test hill. 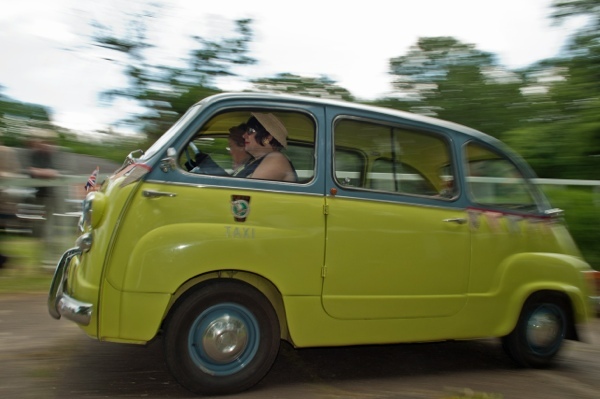 One of the driving tests – one of them was mainly in reverse! 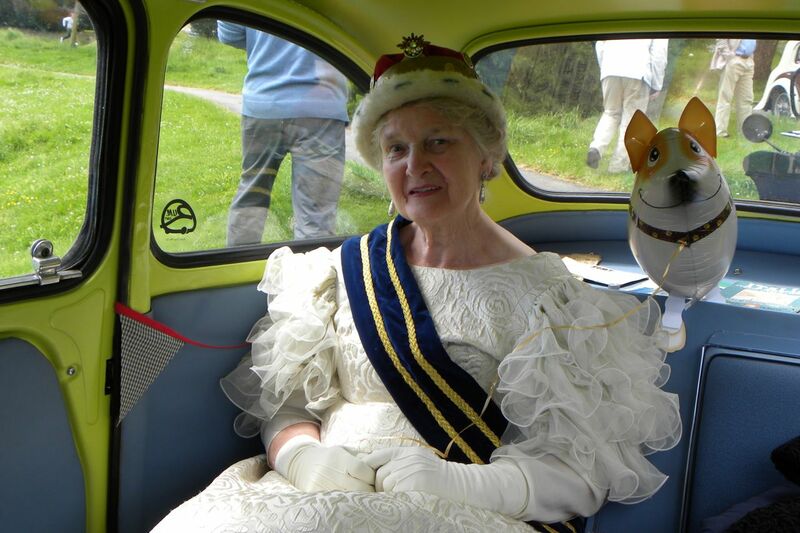 The Diamond Jubilee weekend continued on Monday when the Haslemere Classic Car Show had entered the local Jubilee Carnival Procession. 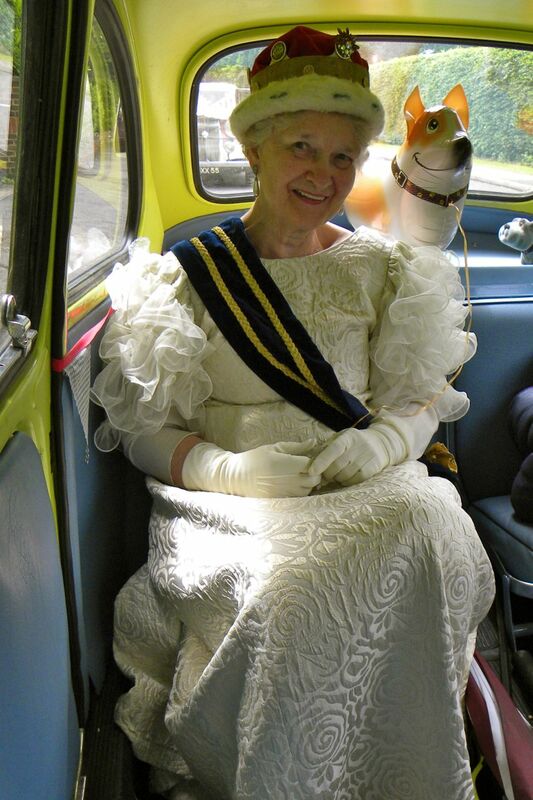 After years of carrying ViP passengers such as Sir Stirling Moss, Adrian Newey and Will Young, Mario was to have the ultimate guest… Her Majesty herself. 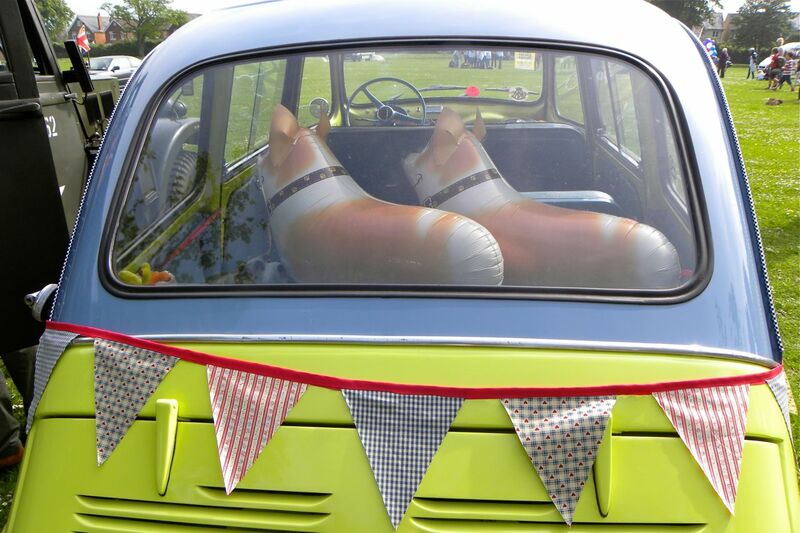 The Queen made herself comfortable in the back (with the remaining Corgi), adorned in the state crown, the bunting fluttered in the breeze and with his vintage clad driver in position we set off on the most important journey of his life. 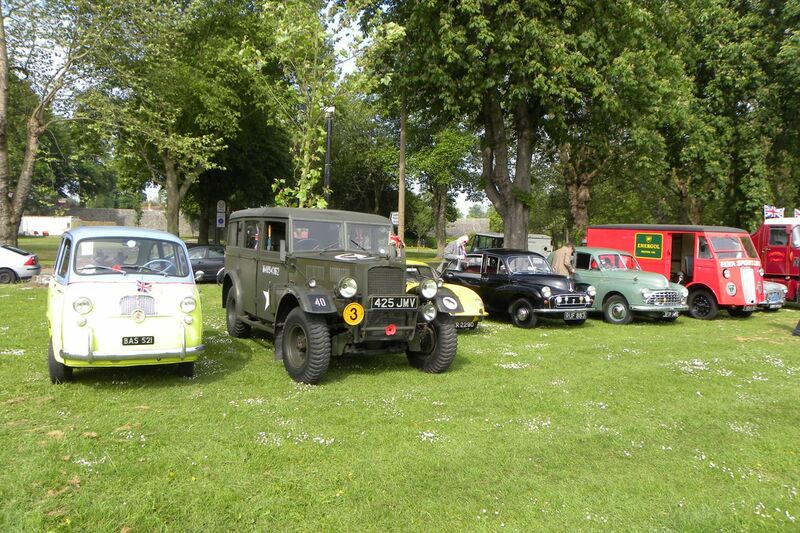 We lined up with other local classic enthusiasts and waited for the off. 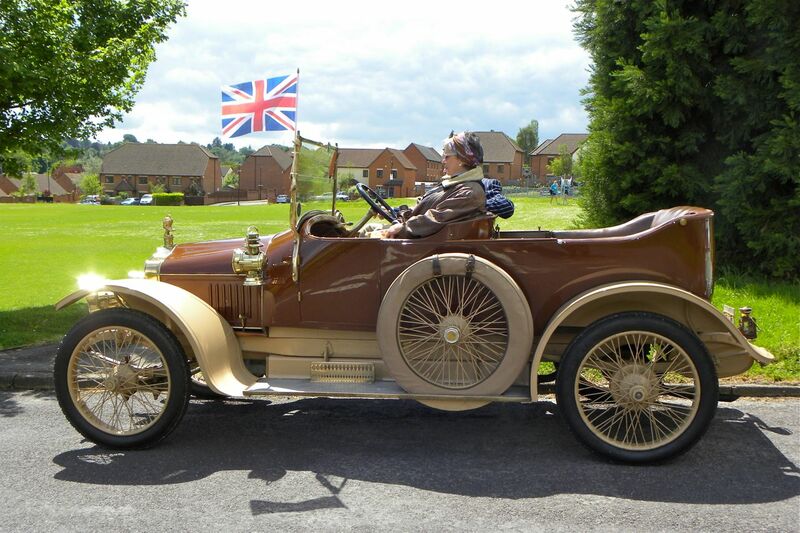 Our ‘Cavalcade’ included a 1900 De Dion Bouton, a 1910’s Minerva, 1930’s MG and Alvis Crested Eagle, 50’s Morris Minor and Sunbeam Talbot 90, the 60’s were represented by a Daimler Dart, Mario and a Alfa Romeo 1750 GTV and the 70’s by a Jaguar E-type and a Triumph Spitfire, quite a diverse little group representing the decades of motoring. 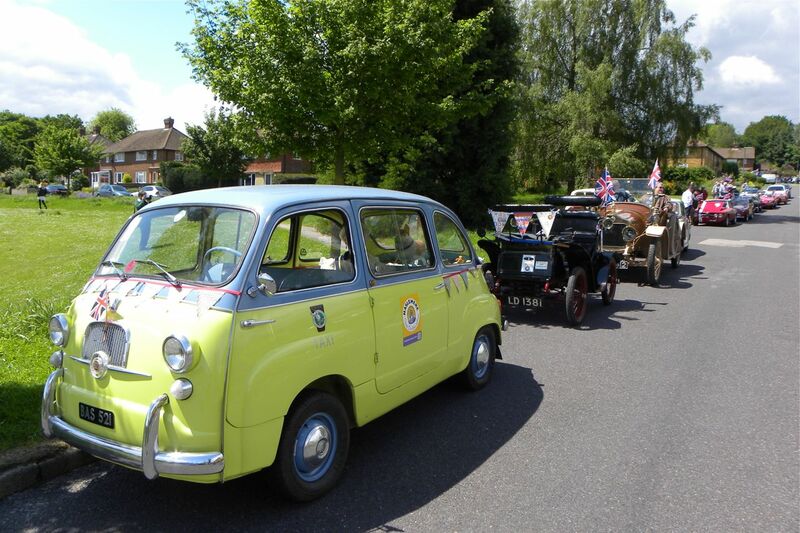 At 2pm the procession set off through the town with the cars interspersed throughout the floats representing many local organisations. Despite the slow walking pace the cars all behaved impeccably. We wound our way along the High Street and Lower Street where the Road works had been removed especially for us. 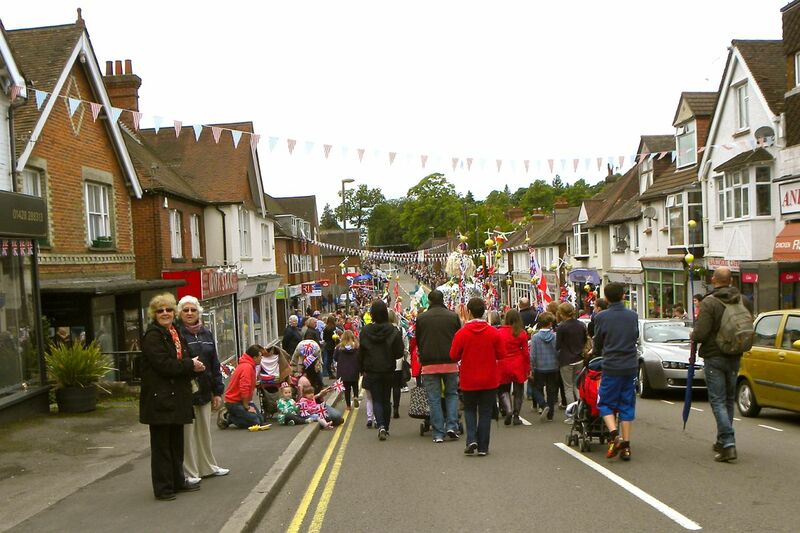 As we approached Wey Hill the crowds swelled and we were greeting by a mass of waving flags. 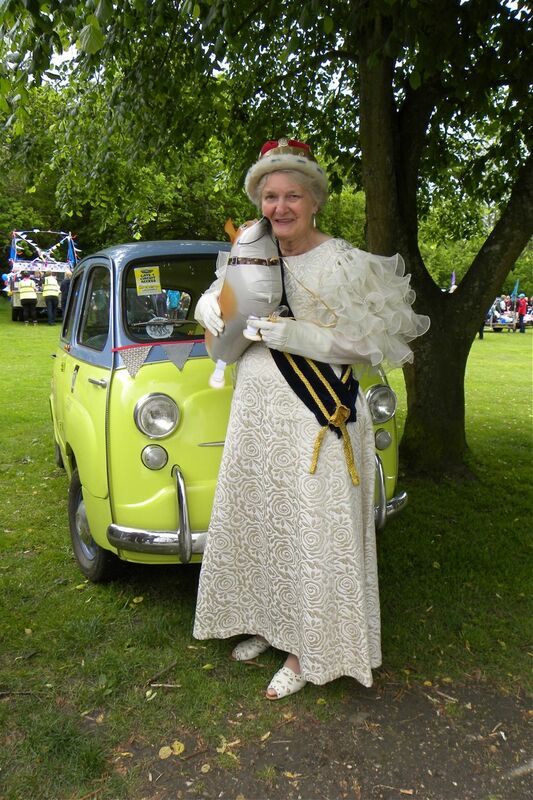 Her Majesty waved to her people and excited children shouted out ‘look it’s the Queen’. We turned onto Lion Green where the town Jubilee Party was being held – cream tea and entertainment for nearly 5000 people and parked up, the public flocked to see Mario and his ViP passenger before she disappeared into the crowd… last seen heading for the tea tent, Haslemere has never seen anything like it and many small children went home excited that they had seen the Queen! 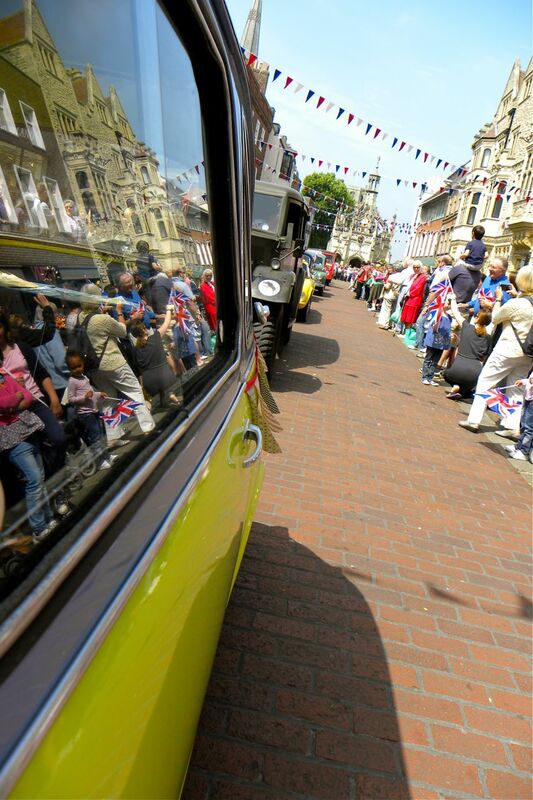 Mario has had a great weekend celebrating the Queen’s Diamond Jubilee. 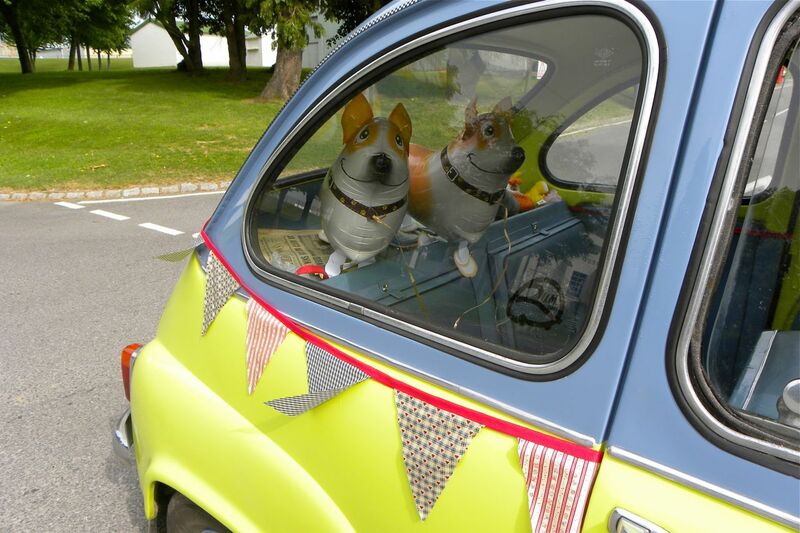 After some last minute preparation – fitting specially made bunting and the Corgi’s, we set off bright and early on Saturday morning for Goodwood. 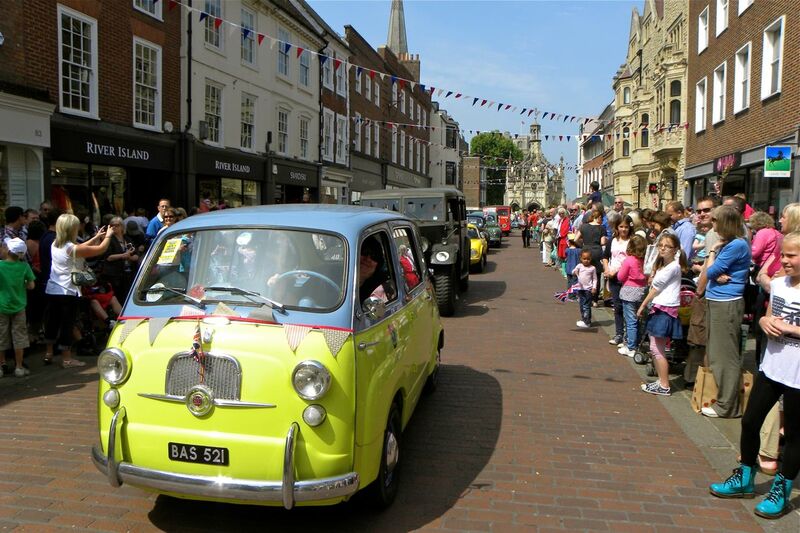 Mario had been invited to join a group of vehicles to represent Goodwood in the Chichester Gala Procession. 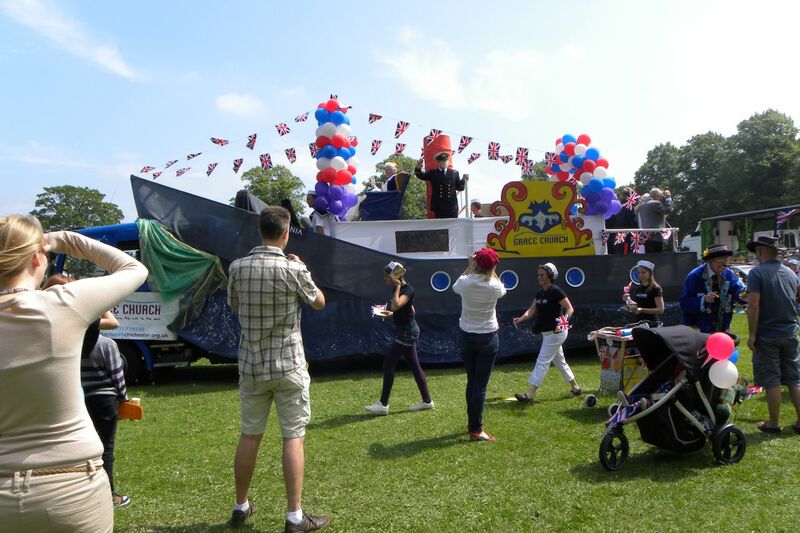 The group soon moved off in convoy to central Chichester where the carnival was assembling. There was quite a bit of waiting around but there was a lot to see with all the other participants arriving and setting up their floats. 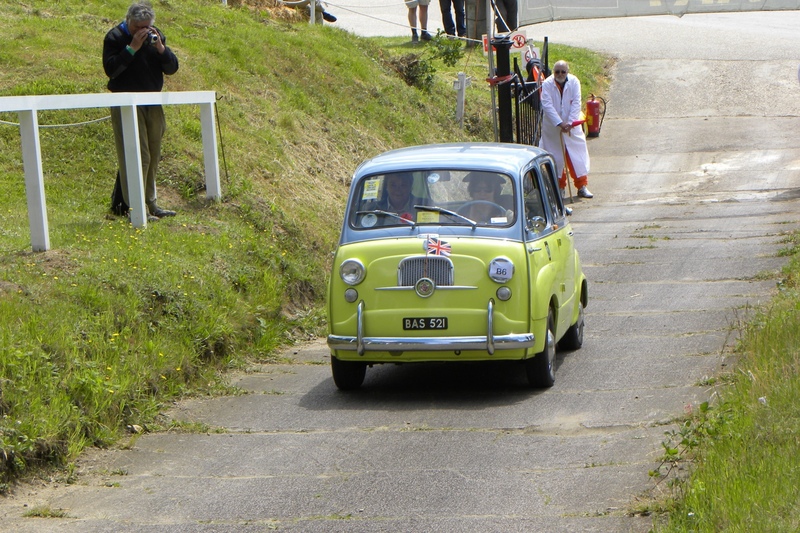 Eventually the procession set off, Mario was leading the Goodwood contingent and as we were in the first batch we were quite near the front. The atmosphere was good with people sitting by the road waving flags and waving but nothing had prepared us fro when we turned into the pedestrian area in North Street. Here the crowd was four or five deep with everybody shouting ‘Taxi’ at Mario. You could hear voices over the cheering and as usual Mario received lots of favourable comments. The procession wound it’s way down East Street and back to the park where we had a chance to watch the rest of the groups come back, there were some great entries including ‘Britannia’, George and the Dragon and some exceedingly cute kids dressed up in uniforms. 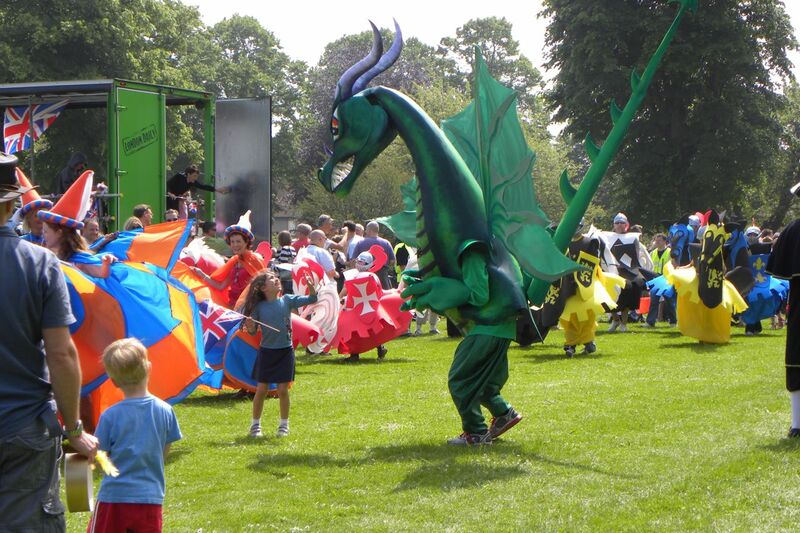 The Carnival was great fun and it was a lovely sunny day. 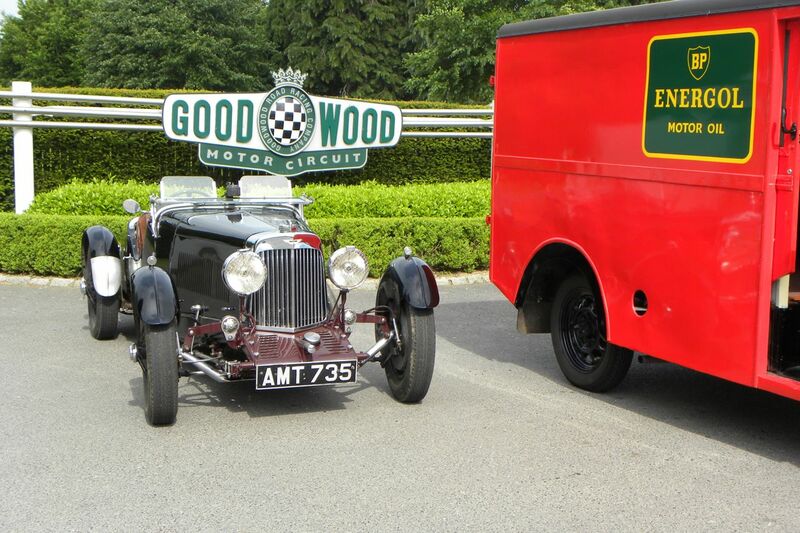 The same couldn’t be said for Sunday morning when we woke up to drizzle but decided to go back to Goodwood for the Jubilee Breakfast Club – the ‘Best of British’. We weren’t very early but by the time we got there the sun was peaking out and a good number of British cars were on display. To be honest we didn’t see anything that interesting but rather liked this Ford Grenada which used to belong to the Royal family and was used at Sandringham.